The Easter Markets opened in Vienna this weekend. I’m really excited about it – not only are they full of fun things to see, enjoy and eat, but they’re a very strong reminder of the best parts of our earliest time as residents of Vienna. Not first when we arrived, but just as we were getting familiar and comfortable with the city, the markets were being set up, and we enjoyed some of our first leisurely weekends exploring them. We stopped by the ones at the Freyung and Am Hof yesterday, but only briefly, because it was almost nap time. We looked around, checked out the beautifully decorated eggs, visited with the bunnies, got a marshmallow confection for Benjamin, ate sausages and kraut, drank frozen cherry and blueberry drinks and generally had a great time. We enjoyed it, but it was just a quick visit, and Benjamin was exhausted by the time we were done. So, after getting her back to our place and settling her in, that’s what we did. It was fun to show her all the sights (including the amazingly gigantic decorated Easter Egg) — most especially the bunnies. Benjamin wanted a cupcake, so we got one for him, and one for me . . . and accidentally ended up with an extra (yep, that kind of thing is still happening). The cupcakes were DELICIOUS (and they have more flavors I’d like to go back and try — including a savory spinach and lox one). We had a very successful trip to the market, and a wonderful first day with Mina (I’m so glad she’s here)! Our week of fun Viennese exploration is off to a great start, and I’m looking forward to all of it! 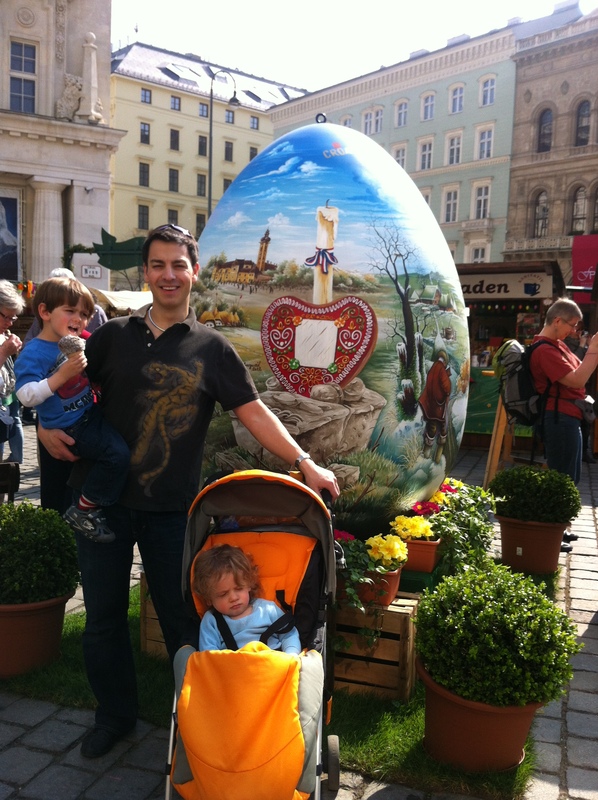 This entry was posted on Sunday, March 25th, 2012 at 4:14 pm	and is filed under Adventure in Vienna, Baby, Em's blog. You can follow any responses to this entry through the RSS 2.0 feed. Responses are currently closed, but you can trackback from your own site.